The Last Roof Coating You’ll Ever Need. 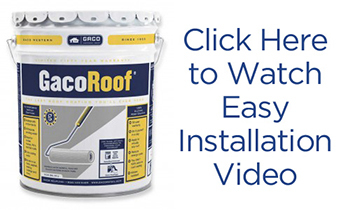 GacoRoof 100% Silicone Roof Coating is designed as a protective coating to seal and repair existing roofs and permanently protect against leaks, permanent ponding water, and the damaging effects of severe weather. GacoRoof is the only coating on the market that stands up to permanent ponding water without bubbling, peeling or breaking down. It will stay flexible and maintain adhesion, even under permanent ponding water or snow pack. And year after year, GacoRoof will not require a recoat. Do it once and you’re done. For your convenience we also created smaller, faster loading video’s in 4 parts. Have you seen the latest Gaco commercial?